“To” Email address – is an address to which regular reports and notifications are sent. You can refer to this address as $AdminMail while configuring monitors or alerts. 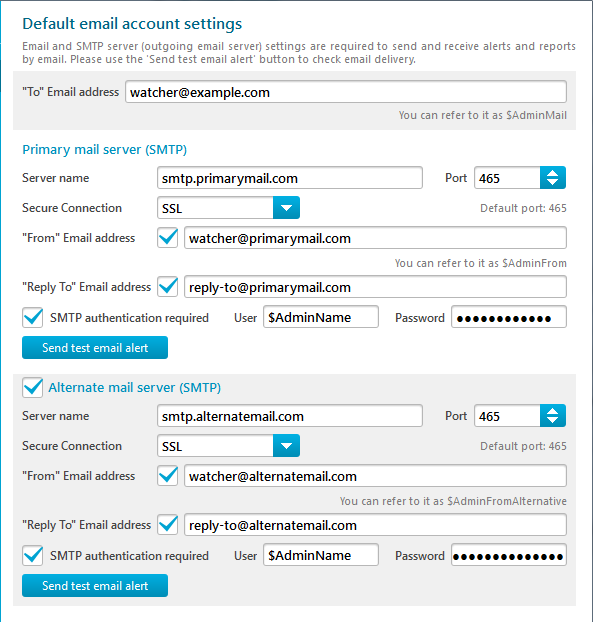 Primary mail server (SMTP) – is an SMTP server name, port number, and optional credentials. You can specify a secure connection (TLS/TLS if available, SSL). A default port is assigned for every choice, unless you choose a non-standard port. You can set custom “From” Email address and “Reply To” Email address to be used as the respective fields for all e-mail messages sent using the primary mail server: regular reports, e-mail alerts, network discovery reports reports, and so on. When “From” is not set, “To” address is used by default. When “Reply To” is not set, “From” address is used by default. In either case actual “From” field is available as $AdminFrom while configuring monitors or alerts. Use custom “From” address when SMTP server requires “From” to belong to its own domain and “To” address is from another domain. Alternate mail server (SMTP) – is an SMTP server name, port number, “From” Email address, and optional credentials. 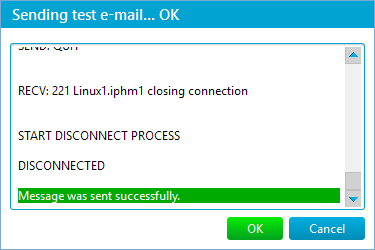 The alternate server is optional; if present, it is used when the primary server fails to send a message. You can specify a secure connection (TLS/TLS if available, SSL). A default port is assigned for every choice, unless you choose a non-standard port. You can set custom “From” Email address and “Reply To” Email address to be used as the respective fields for all e-mail messages sent using the alternate mail server: regular reports, e-mail alerts, network discovery reports, and so on. When “From” is not set, “To” address is used by default. When “Reply To” is not set, “From” address is used by default. In either case actual “From” field is available as $AdminFromAlternative while configuring monitors or alerts. Use custom “From” address when SMTP server requires “From” to belong to its own domain and “To” address is from another domain.